One of the key battles in the history of our movement was the battle over reform versus revolution. Should we work for change in gradual, legal ways or should we fight for deep, revolutionary change? This debate involves contending views of the nature of the state. This debate raged in the years leading up to World War 1, prior to the Bolshevik revolution in 1917. On one side of this debate stood the revisionists of the Second International, today known as “social democrats.” On the other side stood the Bolsheviks led by Lenin. At the time, Lenin was seen as ultra-left and marginal. The great revolutionary innovators have always appeared as such at first. It is the nature of the great revolutionary scientists — Marx, Lenin, Mao, and the Leading Light — that they were able to see beyond what others were able to see, they were able to describe what others could not. They did not just accept the wisdom of their day. Rather, they saw farther than others. They went up to the mountain top and returned to the people. They had one foot in the world of high science and another in the world of the people. They were conduits from the world of science to the world of the people. Being a conduit, imparting revolutionary, scientific consciousness is what real mass line is. This is part of what it means to be a real vanguard, to lead. This is what it means to be a Leading Light. It is important to get past reformist illusions in order to make revolution. It is important to understand the true nature of the reactionary state. Understanding the state’s true nature is key to making revolution and reaching Leading Light Communism, ending all oppression. The Bolshevik revolution led by Lenin and those revolutions that echoed from it were the first real sustained socialist revolutions. They were the first real sustained attempts at building socialism and reaching communism — the end of all oppression. Those revolutions confirmed Marx’s theories of the state. They also advanced our understanding of the revolutionary process. However, in order to understand these lessons, it is necessary to look at the prevailing theories of the revisionists of Lenin’s day. Many people today — social democrats and liberals — reject Lenin’s view; they share a contrary view of the state and the process of social change. The revisionists held the view that the current state could be a neutral or quasi-neutral institution that could be contested by hostile or semi-hostile social forces. In other words, some revisionists saw the state as a kind of neutral institution that could stand above class struggle. It could be used as a kind of mediator between the bourgeoisie and the proletariat. It could be a neutral institution to benefit everyone under its authority. These revisionists believe that since the old state is neutral in some respect, it can be won. 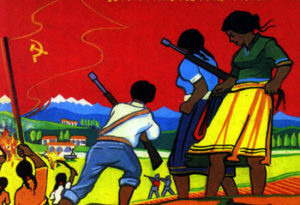 The revisionists promote social unity among imperialist populations. It is true that imperialist workers and imperialist bosses can be reconciled, and reconciled within the state or with the state’s help. However, this is only possible because imperialist workers and imperialist bosses are not antagonistic classes. Social peace can be bought between imperialist workers and imperialist bosses only at the expense of others. And the state can play a big role in that. However, as Lenin pointed out, social peace can never be bought between antagonistic classes. It can never be bought between the global proletariat and global bourgeoisie, with or without a state. The revisionist conception advances their country’s workers over the global proletariat, just as First Worldists do today. Their conception of socialism is not tied to reaching communism, ending all oppression. Rather, their conception is usually an image of national unity tied to material advance for their country’s workers. This particular view is connected to a narrow economism that sees “socialism” mainly as the increase of the material standard of living, not as a radical new order trying to reach communism, to eliminate all oppression globally. These revisionists see their own country’s workers, not the global proletariat, as their constituency. They agitate for their own country’s workers at the expense of the global proletariat. This leads straight to social imperialism and social fascism — imperialism and fascism disguised as socialism. Revisionists are willing to make an alliance between the imperialist country’s workers and the imperialist country’s bourgeoisie via the state. This particular view of the state is used to justify imperialist wars against poor countries and wars against other imperialist countries. The revisionists of the Second International voted to support World War 1 by reasoning that a victory for French imperialism would benefit not only the French capitalists, but also French workers. Similarly, German revisionists held that a German victory would benefit all of German society, including its workers. Lenin criticized this social imperialism and social fascism. Today, First Worldism is the major form of social imperialism and social fascism. Lenin had a very different view. Lenin affirmed Marx’s conception of the dictatorship of the proletariat. Marx once famously described the state as “armed bodies of men.” Of course the state is more than this, but Marx’s point is that monopolization of violence, class oppression, is a key aspect of the state. It cannot be separated from it. Lenin understood this. He saw the state as a kind of weapon for one class to oppress another. The old state is a weapon that can only be wielded by the reactionaries. The state is not a neutral place for antagonistic classes to meet, to work out their differences. The old state cannot be fundamentally reformed to reach socialism. Lenin affirmed the state could be an instrument of either the proletariat or the reactionaries, but not both. The state is always principally either an instrument of friends or of enemies. Lenin’s conception has important implications for revolutionary practice. There is the story of the man who drops his gold off of a ship. He dives into the water after his gold. He drowns. Did he own the gold or did the gold own him? Such is the nature of the reactionary state. Even in the unlikely event that progressive forces get into power within the old state, they do not end up owning the state. Rather, the state ends up owning them. They do not capture the state, the state captures them. Through the process of capturing the old state on its terms, progressive forces become transformed into their opposite. They cannot help but become part of the system even if they claim to oppose it. The old state is not readymade just waiting to be staffed by revolutionaries. The old state cannot simply be captured, it must be smashed. It must be destroyed. The Old Power must be swept away; a New Power must be built in its place. In these red zones, New Power is created. Independent institutions of the oppressed are created. A new state in miniature is created. It is protected by the people’s army, a mighty red army. Schools for the people. Literacy. New revolutionary culture. New art. New song. New dance. Land reform. The liberation of women and youth. People’s courts. People’s committees. A new, collectivist-oriented economy. A new, sustainable relationship between society and nature. Serve the people. Solve the problems of the people. Live the revolution. The new society in miniature. The red zone and its New Power will be a beacon to the world’s oppressed and exploited. Lin Biao expanded Mao’s idea even further. Lin Biao stated that individual people’s wars are part of a much larger global people’s war. Just as Mao’s people’s war moved from countryside to city, so too the global people’s war advances from global countryside to global city. And that, on a global level, socialist countries themselves should be seen as red zones the same way liberated areas within countries are. Lin Biao saw the revolutionary process as one where New Power will expand geographically, establishing more and more socialist countries that act as global red zones. Eventually, the whole First World will be surrounded by global red zones. The First World can then be cut off and finally defeated by the global people’s war. In the coming years, as we initiate the next great wave of revolution, these conceptions will be confirmed and advanced. With the growth of the global slum within the global countryside, it is likely that New Power will take ever new forms. The red zones of the future may look somewhat different than red zones of the past. They will have to be adapted to counter the ever-growing technological capacity of the state’s repressive apparatus. In addition, our conceptions of New Power should account for the growing use of new information technology by revolutionaries. The New Power of the future exists not only on the ground, not just geographically, but in cyberspace also. These important lessons have been confirmed again and again in our history. We must understand the past and advance to the future. In all areas, the Leading Light is putting science in command. Only the Leading Light has elevated revolutionary science in an all-around way to a whole new stage. Leading Light Communism is the pinnacle of revolutionary thought today. It is the new breakthrough. We must follow the Leading Light to genuine communism. We must put revolutionary science in command if we are to really win. ← A First World revolutionary social base?